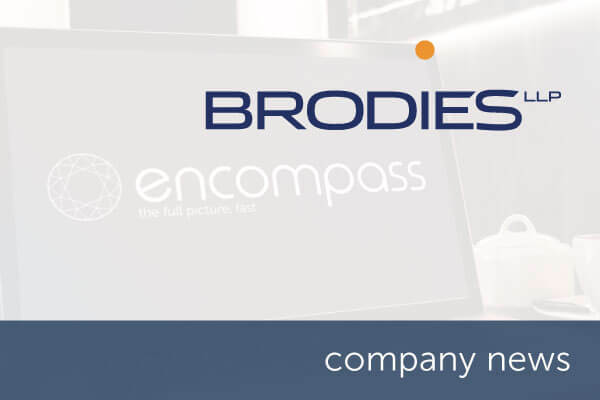 Scotland’s largest independent law firm, Brodies LLP has selected encompass verify to support and enhance its Know Your Customer (KYC) compliance processes. With offices in Edinburgh, Glasgow, Aberdeen and Brussels, Brodies is a full service law firm, covering requirements for business, personal and public sector. Brodies LLP is Scotland’s largest law firm, delivering legal services of the highest quality to Scottish, UK and global organisations. With offices in Edinburgh, Glasgow, Aberdeen and Brussels, the firm offers legal advice to private and public sector clients both in the UK and internationally in its core business areas of corporate and commercial; energy (both renewables and oil & gas); property; litigation; banking and financial services; employment, pensions and benefits and trust and tax. The achievements of Brodies and its partners have been recognised with numerous independent awards in recent years. These include Brodies being named Scotland Law Firm of the Year at the Who’s Who Legal Awards 2017, UK National/Regional Law Firm of the Year at the Legal Business Awards 2017, UK Regional Law Firm of the Year at the Lawyer Awards 2016, UK Law Firm of the Year at the British Legal Awards 2014, and Legal Advisor of the Year at the Business Insider Deals and Dealmakers Awards 2014.